Ketzing. Date is according to marriage record. Aug 17, 1801 has been used by Willard Smith. Place of birth was no doubt Ketzing estate where many Anabaptists lived and worked. No birth document has been found. Miller at Cheppe, Commune of Dompcevrin.The mill was destroyed in 1914 during the war, only ruins remain. 48°56'11.53'' N / 5° 29' 35.00'' E A small village next to Dompcevrin that included Cheppe mill. On ship list name recorded as Jno. Gerrard. Family lore says the trip lasted 44 days. Page 176: John Shrock, age 60, farmer, b. France; John age 17, farmer, b. OH; Magdalene age 16, b. OH. Page 18: John Schrack, age 70, farmer; Jacobine, age 53, keeping house, born in Baden. The information below doesn’t belong to Johannes. Does it belong to his son John? Real Estate valued at $8000, Personal Estate at $2000. Living in the same dwelling were John, Jr., age 30, farmer; Phoebe, age 24, keeping house; Peter 3; Catharine 2, and Daniel 5/12. This family was living next to Peter Unzicker family in dwelling 119. 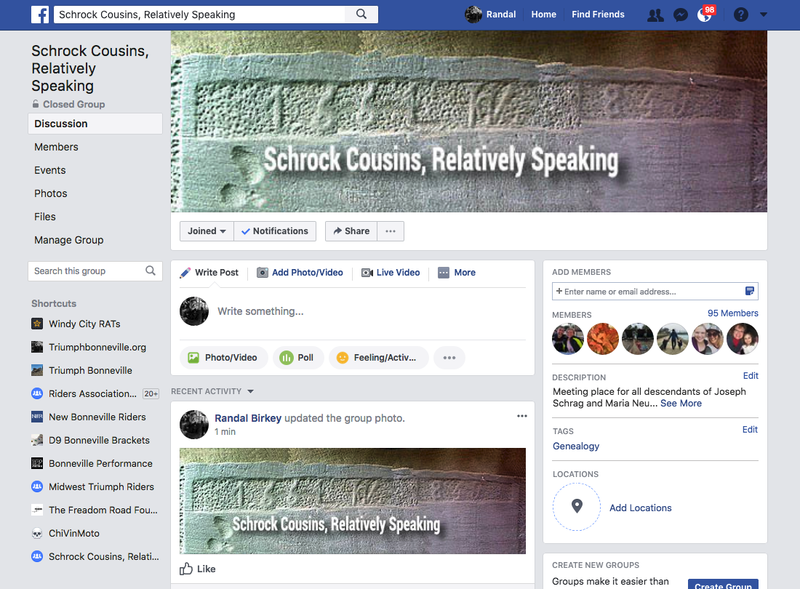 “John Schrock, a native of Lorraine, was of German ancestry, but was educated in French, which he spoke like a native. He was wedded to a lady of Lorraine, Miss Catherine Saltsman, and when the couple were the parents of two children, Joseph and his sister Catherine, they came to America in 1831 leaving the port of Havre in the spring. The passage across the boisterous Atlantic consumed forty-four days. They at length disembarked in Baltimore, Md., very much fatigued from the hardships they had endured during the long journey. From there they went to Lancaster, Pa., and a year later, in 1832 removed to Ohio, and located on a farm which the father operated, and in connection with it rented a mill, which he managed very successfully, it being the business in which he was most proficient. While living in Butler County, Ohio, the family was increased by the addition of three children, namely: John, Peter and Magdalena, who were bright and intelligent, and their mature years have not disappointed the fond expectations, which their parents conceived of the little French-Americans. In the autumn of 1850, Mr. Schrock and his family removed to Tazewell County, Ill., and located near Pekin, taking up wild land, but subduing it by patient industry until at their decease they were surrounded by numbers of broad acres well cultivated and supporting numerous fine domestic animals. During life they were members of the old Amish Church, and died in that communion. The father entered into his rest in his seventy-fourth year and the mother in her fifty-seventh." “...Back in Ohio lived Johannes Schrock, German born and also a follower of Menno. Schrock found Ohio pretty well settled, but from the Mennonites in mid-Illinois he heard of a growing new land where acres were cheap and crops were abundant. So Johannes Schrock with three horses, pushed through from Trenton, Ohio, to Pekin and looked at this new west. He liked it. He left one horse here and drove the other two back to the Buckeye state. Arriving, he told the anxious wife, who had been Katharina Salzman in her girlhood days in Germany, that they were moving to Illinois. To Joe, the oldest youth, was given the task of driving through with the horses and cattle and what goods they had. The father and mother took the rest of the family to Cincinnati where they took a boat down the Ohio to Cairo and up the Mississippi and Illinois to Pekin. Joseph’s son, Jonathan, was later able to point out to his family an American elm tree along the road west of Bloomington where Joseph had camped under his wagon the last night of his trip from Ohio. He had the reputation of being an excellent marksman. When Johannes and his family first lived in Tazewell Co., they probably worshipped in the old Railroad School just across the road from Johannes’ land. W. A. Ropp writes about the school: “This school was begun about 1840 and continued to operate until 1872 or 1873 ... about the year 1835, a company was organized to build a railway eastward from Pekin--the grade was finished nearly to Tremont when the panic of 1837 stopped the work. A primitive log school house was built near the newly-graded roadway and was named the Railroad school, altho there was no railroad within a hundred miles. “Most of the land already had been taken up by settlers, for it consisted of some small, rich, open glades just lying round to let the sunshine in, and a good grade of timberland covered by a magnificent growth of hardwoods and elms--tall, straight and clean-trunked--that gave the township the name Elm Grove. [S134] Descendants of Christian Birky. [S129] Portrait and Biographical Album of Woodford County, Illinois , (Chapman Brothers, Chicago), Info under son Joseph’s entry. [S745] Promised Followup re Robert-Espagne Schrocks, Neil Ann Stuckey Levine. [S178] Johannes (John) Schrock Naturalization Document. [S348] John Schrock and Phebe King - Marriage record . [S329] McLean Co., IL Marriage Records. [S398] Amish Mennonites in Tazewell Co., Joseph Staker, 3 Dec 1865. [S129] Portrait and Biographical Album of Woodford County, Illinois , (Chapman Brothers, Chicago). [S739] Narrative given by Alvin J. Schrock in Morton at next to last Joseph Schrock Reunion in 1976.. Taped by Roy Schrock. Transcribed by Don Schrock. [S366] The Old Railroad School, Who Here Remembers It?, W.A. Ropp.